When Jake Rudd is saved from a brutal beating, he can’t believe his luck. Not only is his saviour an attractive redhead, she’s an old flame. Suddenly his plans to settle down seem a real possibility. Unfortunately, Ros West has no memory of him, and with trouble following her, no reason to trust him. Only when family and friends are threatened by a power-hungry businessman, do the long shadows of the past bring events full circle. Now, side by side, Jake and Ros must deal with the past to secure the future. But when the smoke clears, will old scores be settled or will the truth prove more dangerous than a smoking gun? From the very beginning Terry James hooks the reader with the fact that Rudd knows his saviour, seems to have had a past with her, yet she has no recollection of him. It’s the question of how this can be that snares the reader, and Terry James makes sure you stay firmly hooked by hinting at, and half explaining, Ros and Rudd’s previous relationship. It’s not only Ros and Rudd’s past that provides all the captivating intrigue to this fast moving, action packed, story. There’s other characters who might not be all they seem. 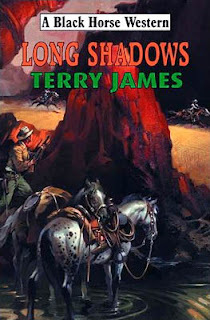 And as the tale progresses Terry James expertly adds more twists and surprises that make sure this book very difficult to put down before you reach the end. An end that ties up all the threads of the storyline neatly and satisfactory. Terry James – real name Joanne Walpole – is a new writer to the Black Horse stable, and, on the strength of this book, I hope it isn’t long before she writes another. Long Shadows has a release date on May 29th, but is available from internet book sellers now. A very nice review. Thank you. I had problems leaving this book alone. Terrific job, Jo and splendid review Steve.